Raising Money For Tribute Bears! We are very excited about the support we received from Build-A-Bear Workshop, Watkins Glen International, the Motor Racing Network and the NASCAR community last month! As a result of their great support, we have an incredible fundraising auction coming up! As you know my human-owner PFC Benjamin Jeffrey is currently deployed to Afghanistan with the 2/2 Stryker Brigade Combat Team from Fort Lewis, WA. As part of OPERATION:B.E.A.R. we are raising money to deploy a teddy bear to every child and family of our Fallen Heroes from the Brigade that are killed in action during this deployment time. With such a strong commitment to the military and military car sponsorship, NASCAR is a perfect fit for the Tribute Bear Fundraiser. The bears signed at Watkins Glen International during the Finger Lakes 355 will be part of a November fundraising auction. 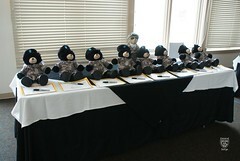 The auction coincides with Veteran’s Day and we will be taking bids on the autographed teddy bears from November 1-11, 2012. This is a great opportunity for people to show support for our Fallen Heroes who are part of Enduring Freedom 12-13 currently deployed with the 2/2 Stryker Brigade Combat Team 2-1 Infantry located at Fort Lewis, WA. The money raised from the auction will help us deploy teddy bears to children and family members of our Fallen Heroes from the FT. Lewis Brigade currently deployed. Motor Racing Network – The entire broadcast team including Eli Gold and more! Carl Edwards – The winner of the Saturday Nationwide Race at Watkins Glen this year. Finger Lakes 355 – Signed by ALL the drivers from the Finger Lakes 355 race! Be sure to tell all your friends and stay tuned for more details on this exciting fundraiser! This entry was posted in 2012 General Sarge Posts, Fundraisers and tagged Build-A-Bear Workshop, General Sarge, NASCAR, Teddy Bear. Bookmark the permalink.